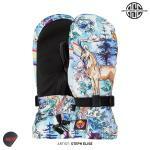 Whether you prefer a snowboarding glove or a snowboarding mitten then we've got all bases covered. Choosing which is entirely down to personal preference. We stock a wide range of women-specific technical snowboarding gloves and snowboarding mittens from leading snowboard brands such as Burton, Death Label & Dakine. Whether you want a warm & waterproof winter glove, a thinner spring riding pipe glove or even just a glove liner for extra warmth the you're in the right place. As always, our friendly staff are here to help. If you'd like advice or more information about any of our products please feel free to give us a call at one of our stores.